Truth is I'm concerned that as an Anti-War demonstrator, Peace Activist and general dissident of Howard, that I am a "Terrorist" - who somehow poses a threat to National Security? Am I? Are you? "I can not guarantee that Australia will not be the subject of a terrorist attack. No law can guarantee that." - John Howard 27th September 2005. The preventative detention powers agreed to by our beloved WA leader yesterday, will allow suspect persons to be held for up to two weeks by state police and 48 hours by federal police. That's without charge or trial. For my mind, I'm very concerned that these laws will restrict my personal right to free speech; suppress my voice as a dissident of government policy and put me, my family and friends at risk. If Scott Parkin was labeled a threat to national security [ie a potential "terrorist"] then I too should have something to fear from ASIO and the Prime Minister. Surely in our reasonably open and transparent democracy we have the right to Protest and speak out! 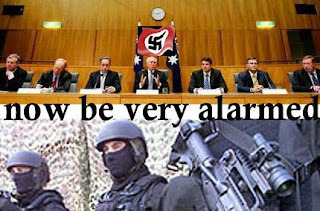 Who are the terrorists, when totalitarian laws are put in place to scare us into silence? Keep an eye open because in the wake of these new laws, police can hold terror "suspects" for up to 14 days without charge, use tracking devices to monitor their movements, and seek penalties for people who "incite" terrorism. The new counter-terrorism laws have been described as, totalitarian, retrograde, draconian, path to a police state, a fascist regime, an absolute disgrace, a dereliction of duty - the list goes on. In a race for seeing to be doing something, the State Premiers and Prime Minister of Australia have all failed to protect our very own human rights and safeguard our way of life. As Australians, we will regret it for years to come. Patrick Emerton, the co-author of a report by legal academics and community lawyers opposing the Commonwealth's anti-terrorism proposals, said the agreement on preventive detention and control orders was very disappointing. "We still haven't seen any detailed evidence put forward as to why we need these measures, which undermine Australia's tradition of liberal democracy," he said. He said the proposed laws were un-Australian measures that would sit more comfortably in totalitarian countries where people could be locked up without proper safeguards. The Islamic Friendship Association of Australia, warned that the new laws represented a severe erosion of individual freedoms and would create fear and division in society. He said Australians should be worried at the possibility that they could be detained for questioning for up to 14 days, on the basis of nothing more than "intelligence". "It's very frightening to think of the future," he said. But its not just the Muslim community who need to be alarmed. Its activists and demonstrators too. Its the average commuter at threat of Eight shots to the head for catching a train. Its every Australian with a bone to pick with Howard. LOOK OUT! I wonder just how long its going to be before ASIO come barging through my front door, take me away to an undisclosed location, keep me for an indefinite period - simply because I may be a "threat to the safety and security of the Australian community," - simply because I disagree loudly with Howards ludicrous totalitarian measures.